Selling a house and trying to catch the eyes of as many buyers as possible? Best strategy is to tout certain features, which apparently can help sell houses faster and for more money, according to national search of house listings by Zillow. What they found is that house listings with "barn door" in the listing description captured the highest premium, selling for 13 percent above expected and 57 days faster. 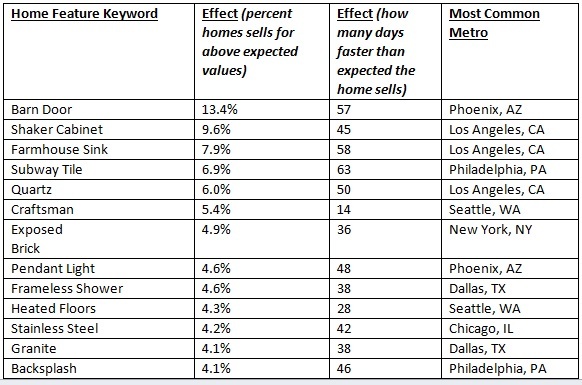 Listings with other top keywords included shaker cabinets, which sold for 9.6 percent more than expected, farmhouse sinks sold for 7.9 percent more than expected and those with subway tiles sold for 6.9 percent more than expected. Listings that mentioned "quartz” sold for 6 percent more than expected.